In a plastic zip lock bag or container marinate the chicken breasts with all the ingredients from 4-24 hrs and keep them aside in fridge. In a non stick skillet/pan add 2 tbs. of olive oil and add cumin seeds. As soon Cumin seeds splutter add salt and pepper and peas. When the peas turn little brown add boiled Rice to it. Make sure there is no water left in boiled rice before you add this to the pan. Your pulao is ready. Now for Chicken, take out marinated chicken from fridge 20 minutes before cooking, so that it comes down to room temperature. Spray some olive oil in non stick skillet and turn the heat onto med high. When the pan turn hot add your chicken breasts without marinating liquid. Let the chicken cook each side to 5-8 minutes each. In the mean time, on low heat add leftover marinating sauce and reduce it till it is thick. Take one lime or lemon zest and add to your reducing sauce. 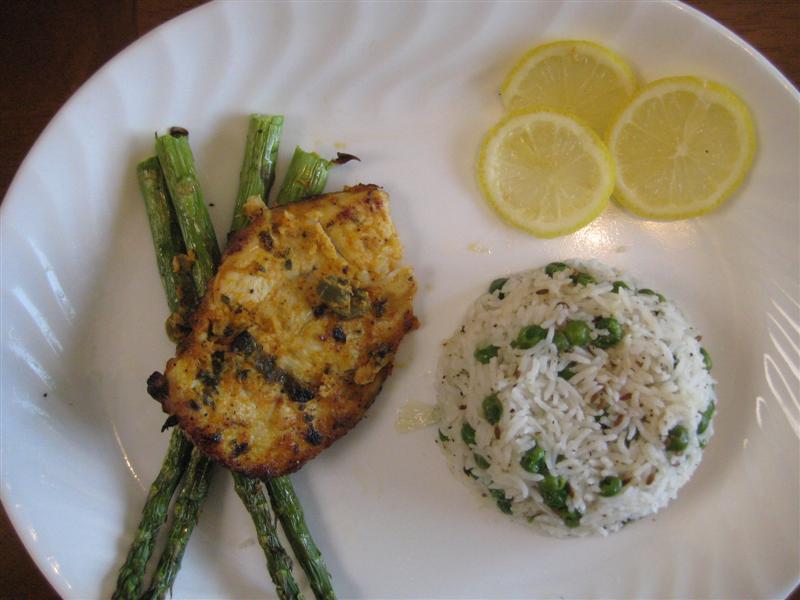 Serve hot and crispy chicken breasts with Rice Pulao and garnish chicken breasts with the marinating sauce with any kind of roasted vegetables.